United Bank for Africa(UBA) Plc., one of Africa’s leading financial services institutions, has been given impressive ratings by two top world leading rating agencies, Global Credit Rating Co. (GCR) and Fitch Ratings (Fitch). The good ratings attest the Group’s strong liquidity, solid risk management and robust balance sheet. GCR assigned UBA a long term national rating of AA- and a long term international rating of B+, both with stable outlook. The agency also affirmed the first two issuances of the Group’s N400 billion Medium-term Debt Capital Raising Program as high investment grade instruments, based on the Group’s strong fundamentals and widespread brand recognition. GCR emphasized the Group’s long corporate history and diversified risk and earnings base as other factors that influenced the rating outcome. In a related development, Fitch affirmed UBA’s long term foreign currency rating at B+ and its long term national rating at A+(nga). The agency crowned the ratings with stable outlook, citing strong earnings recovery, low impairment risks and high liquidity as key drivers of the rating results. Commenting on the ratings, Mr. Phillips Oduoza, Group Managing Director/CEO of UBA Plc believes the positive outcomes came on the back of solid recovery in earnings, following deliberate management decision to clean up the balance sheet, as well as the sustained improvement recorded by operations outside Nigeria. He also highlighted recent awards as African Bank of the Year by The Bankers Magazine, as one of the developments that has raised stakeholders’ perception about the Bank. “This is a strong indication of the positive impact of our collective drive and steadfastness in reclaiming our leadership position in the industry,” Oduoza said. 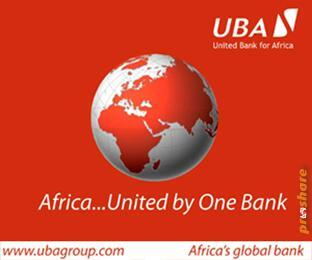 United Bank for Africa Plc. is one of Africa’s leading financial institutions offering financial solutions to more than 7million customers with presence in 19 African countries and3 global financial centers. UBA is committed to partnering with stakeholders in all the countries the Bank is located, providing innovative banking services, promoting trade and investment, and developing infrastructure.